“TV pilot on steroids” is a phrase you’ve probably heard me throw around either here at The Ferguson Theater or on an episode of Better In The Dark. But just in case you haven’t, here’s what I mean by that. Sometimes I watch a theatrical movie and the way the situation and characters are presented and constructed feels like the filmmakers are setting up a television series. You know what I mean. How many times have you seen a movie in a theater and thought “That would be a great TV series!” Too many times to count, I bet. That’s the way I felt after having watched ZERO EFFECT recently. I remember watching this on VHS years ago and appreciating it as being a really ingenious and unique variation on the concept of a modern day Sherlock Holmes. The mysterious and brilliant Daryl Zero is a character that would be right at home on the USA network along with the other offbeat characters headlining their popular shows. I was made aware that there actually was an attempt to turn ZERO EFFECT into an NBC TV series starring Alan Cummings as Zero but it didn’t catch on. And that’s really a shame as ZERO EFFECT has tremendous potential as a series. I’d certainly watch it every week. Daryl Zero (Bill Pullman) is the world’s most private private detective. He never meets with his clients, preferring to deal with them through his legman/assistant Steve Arlo (Ben Stiller.) And that’s a good thing because Daryl Zero is…well, nuts. He’s horribly inept in social situations, downright rude and mean, lives on a diet of canned tuna fish, methamphetamines and Tab while writing truly terrible folk songs (although truth to tell, I actually kinda like “Let’s Run Off And Get Married.”) But give him a case to work on and he suddenly transforms into a coolly confident, smooth, totally fearless professional investigator whose courage and near superhuman gift of observation while maintaining a emotionless objectivity toward his client and other people involved guarantees that he will solve the case. His latest one seems very simple and Steve Arlo doesn’t even think it’s worth their time. Millionaire Gregory Stark (Ryan O’Neal) has lost the key to a safety deposit box and it’s vitally important that he find it as it’s linked to a complicated and elaborate blackmail scheme. And indeed, Daryl Zero figures out that the blackmailer is Gloria Sullivan (Kim Dickens) an EMT who works out at the same gym as Stark with ridiculous ease. Arlo figures that wraps everything up but not so. Zero is intrigued as to why Gloria is blackmailing Stark and continues his investigation. This forces him to interact with Gloria and threatens to compromise his cherished objectivity as he finds himself strongly attracted to Gloria. In the meantime, Arlo is resisting Stark’s repeated attempts to pressure or bribe Arlo into betraying Zero and giving Stark the name of the blackmailer so that Stark can have that person killed. He also is getting pressure from his girlfriend Jess (Angela Featherstone) who wants him to quit working for Zero and start working on them getting married. Now before The Spoiler Police starts in on me because I revealed the identity of the blackmailer, let me explain that who is doing the blackmailing is nowhere near as important as why Stark is being blackmailed and that turns out be the real mystery that has to be solved. That and the mystery of his own emotions as Zero finds himself doing some very unexpected things contrary to his nature as he gets closer and closer to Gloria, irresistibly drawn to her as she’s the only person he’s ever met that can get into his head. 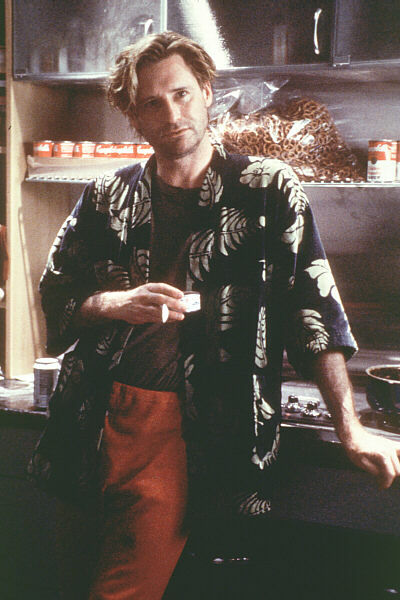 Bill Pullman is really amazing as Daryl Zero. Pullman is an actor who for years has danced on the edge of being a major star but never could seem to find that one role to put him over the top. When we first meet Daryl Zero he seems like such a weirdo it’s impossible to imagine he could be the kind of detective Steve Arlo describes to Stark as being so brilliant that in one hour and without ever leaving his home he locates a missing man the FBI hadn’t been able to locate for eight months. But once he’s on the case he turns into a totally different man and Pullman sells the transformation. Ben Stiller is one of the most frustrating actors I’ve ever seen on screen. When he’s cooking on all burners he can be excellent. But when he’s bad he stinks like a houseguest who doesn’t know when it’s time to go home. Fortunantly we get the former Ben Stiller here. Steve Arlo is continually frustrated by Zero’s bizarre, manic mood swings and method of operation but he also cares for him and is fascinated by the man’s personality. 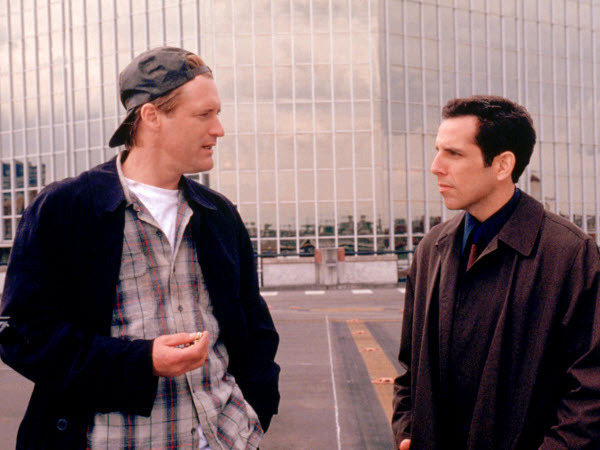 Stiller does an excellent job here and I think gives one of his all-time best performances. Since the plot of this movie is loosely based on “A Scandal in Bohemia” you can kinda guess where the relationship between Gloria and Zero is going to go and you’d be right. Kim Dickens is absolutely charming as Gloria and during the course of the movie I grew more and more to understand why Zero is becoming intrigued with this woman. In recent years I’ve been wondering why Ryan O’Neal is slowly morphing into William Shatner and I believe it may have started here. There are scenes where O’Neal’s mannerisms and way of delivering his lines are uncannily a lot like Shatner’s. He even looks like Shatner at times. So should you see ZERO EFFECT? 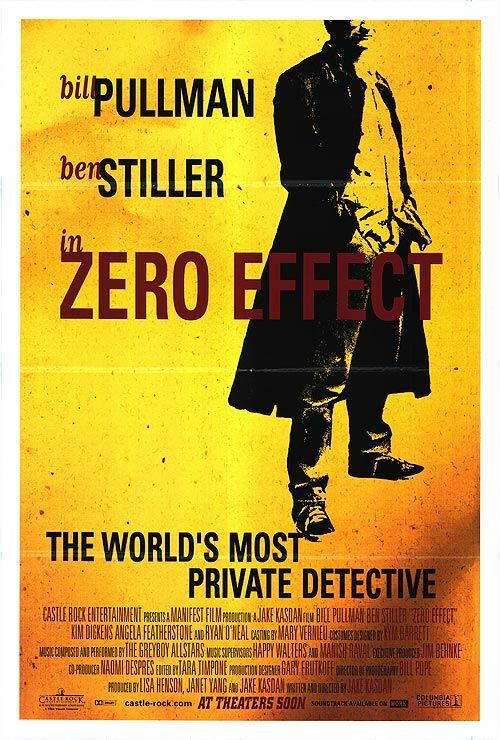 If you’ve never seen it and if you’re a fan of characters such as Sherlock Holmes, Nero Wolfe, Adrian Monk, Jacob Hood and Gregory House then you’ll enjoy ZERO EFFECT, trust me. Enjoy.